Moving beyond rapalogs: how to prepare second generation trials? The mammalian target of rapamycin (mTOR) pathway is a central pathway that regulates mRNA translation, protein synthesis, glucose metabolism, lipid synthesis and autophagy, and is involved in malignant transformation. Several randomized trials have shown that the use of mTOR inhibitors could improve patient outcome with hormone receptor-positive or human epidermal growth factor receptor-2-positive breast cancer. This review analyzes new perspectives from these trials. Preclinical studies have suggested that the mTOR pathway may play a role in the resistance to hormone therapy, trastuzumab and chemotherapy for breast cancer. This concept has been tested in clinical trials for neoadjuvant treatment and for metastatic breast cancer patients. Also, much effort has gone into the identification of biomarkers that will allow for more precise stratification of patients. Findings from these studies will provide indispensable tools for the design of future clinical trials and identify new perspectives and challenges for researchers and clinicians. As a serine/threonine kinase and downstream member of the phosphatidylinositol-3-kinase (PI3K)/protein kinase B (AKT) and adenosine monophosphate-activated protein kinase (AMPK) pathways, mammalian target of rapamycin (mTOR) is a key regulator of cell growth and metabolism. In cells, mTOR is a component of two structurally similar complexes, mTOR complex 1 (mTORC1) and mTOR complex 2 (mTORC2). Both complexes contain mTOR, the DEP-domain containing mTOR interacting protein and mLST8 (mTOR associated protein); mTORC1 also includes the regulatory associated protein of mTOR (RAPTOR) and a 40 kDa proline-rich AKT substrate, while mTORC2 contains the rapamycin insensitive companion of mTOR (RICTOR), the mammalian stress activated map kinase interacting protein 1 and protein observed with RICTOR. The mTOR complexes are functionally distinct. mTORC1 promotes mRNA translation and protein synthesis by phosphorylation of ribosomal protein S6 kinase (S6K1) and eIF4E binding protein 1 (4E-BP1), and inhibits autophagy. Moreover, mTORC1 has roles in glucose metabolism, lipid synthesis and can phosphorylate the estrogen receptor (ER) via S6K1 . mTORC2 organizes the cellular actin cytoskeleton and regulates AKT phosphorylation . For full activation AKT requires phosphorylation by PI3K (threonine 308) and mTORC2 (serine 473) (Figure 1). mTOR can be activated by the PI3K-dependent pathway though AKT activation and dual inhibition of tuberous sclerosis 1/2 (TSC1/2) and Ras homolog enriched in brain (Rheb) and can be regulated by the AMPK-dependant energy pathway  (Figure 2). 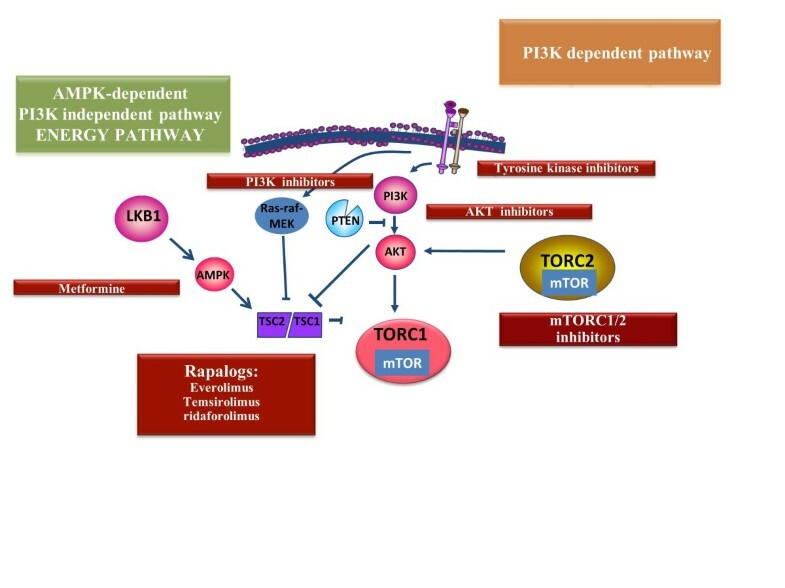 Indeed, AMPK activated by the liver kinase B1 (LKB1) tumor suppressor can phosphorylate TSC2  or directly phosphorylates RAPTOR in order to inhibit mTORC1 . 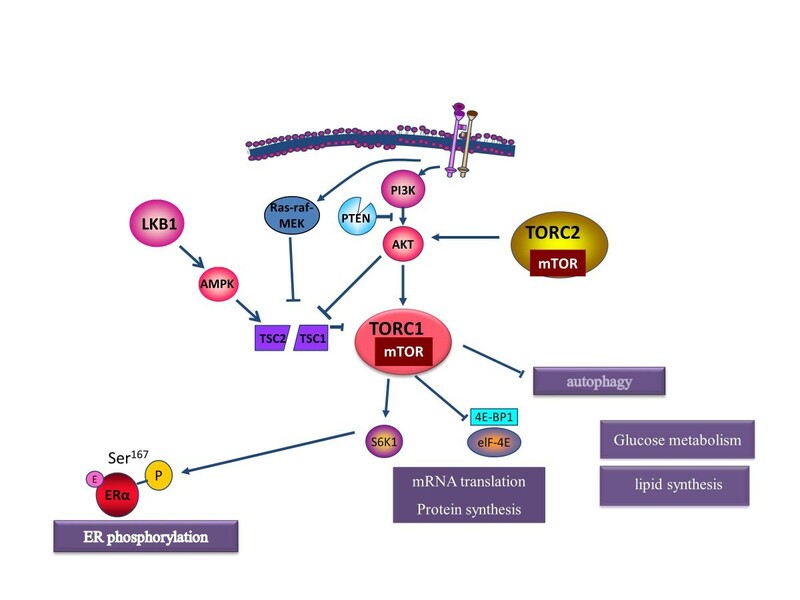 mTOR pathway and actions. Schematic representation of the phosphatidylinositol-3-kinase (PI3K)/protein kinase B (AKT)/mammalian target of rapamycin (mTOR) pathway. mTOR complex (mTORC)1 is involved in mRNA translation and protein synthesis, glucose metabolism, lipid synthesis, and estrogen receptor (ER) phosphorylation and inhibits autophagy. mTORC2 functions in AKT phosphorylation on serine 473 and regulates the cellular actin cytoskeleton. 4E-BP1, eIF4E binding protein 1; AMPK, adenosine monophosphate-activated protein kinase; E, Estrogen; LKB1, liver kinase B1; MEK, mitogen activated protein kinase/extracellular signal regulated kinase; P, phosphorylated; raf, rat fibrosarcoma virus; Ras, rat sarcoma virus; S6K1, ribosomal protein S6 kinase; TSC1/2, tuberous sclerosis 1/2. mTOR-dependent pathways and inhibitors. Mammalian target of rapamycin (mTOR) depends on two pathways: the phosphatidylinositol-3-kinase (PI3K)-dependent pathway and the 5′ adenosine monophosphate-activated protein kinase (AMPK)-dependent pathway (the energy pathway). Various inhibitors have been reported to act on one kinase in each of the pathways. LKB1, liver kinase B1; mTORC, mTOR complex; TSC1/2, tuberous sclerosis 1/2. Interestingly, a large panel of activating mutations is found in the mTOR pathway, including PI3KCA (the PI3K catalytic subunit alpha isoform), AKT1 and mTOR mutations, as well as PTEN loss. Drugs targeting various levels of the mTOR pathway have been developed, including PI3K, AKT and mTOR inhibitors. 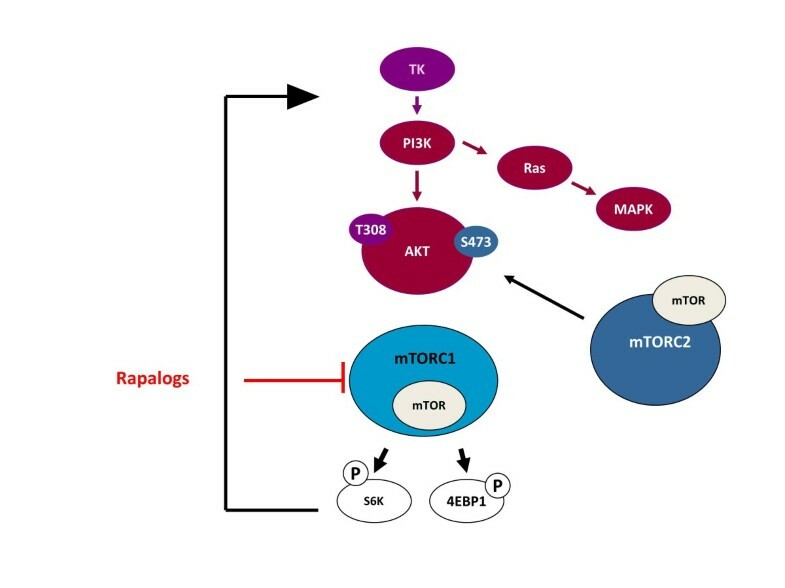 mTORC1 is the biological target for rapalogs such as everolimus and temsirolimus, whereas other inhibitors are capable of simultaneously targeting both mTOR complexes. Endocrine manipulation is the principal treatment for ER + breast cancer patients, both in the early and advanced phases of the disease. However, not all patients with ER + tumors are sensitive to endocrine treatment (primary resistance) and a proportion of initially sensitive patients may develop a secondary resistance during or after treatment. Multiple mechanisms of resistance to anti-endocrine agents have been described. mTOR activation was shown to mediate resistance to endocrine therapy in preclinical models . 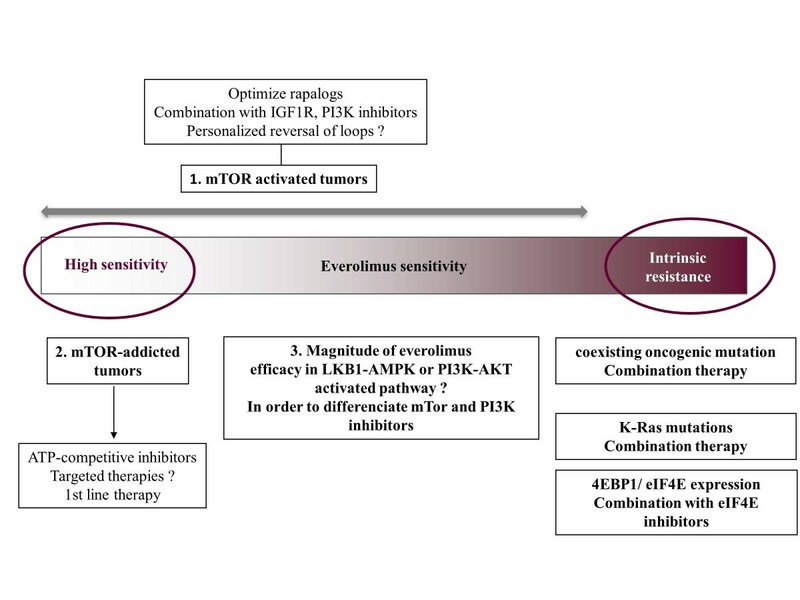 Furthermore, mTOR inhibitors such as everolimus synergized with letrozole in preclinical models  and mTOR was described as a mechanism facilitating escape of long-term estrogen deprivation . The addition of mTOR inhibitors to endocrine treatment has been investigated in phase II and III studies, including patients with hormone receptor-positive (HR+) and human epidermal growth factor receptor-2-negative (HER2-) breast cancer. Three major randomized trials have reported consistent data on everolimus efficacy in ER + breast cancer. In a randomized phase II neoadjuvant trial including 270 patients, everolimus in addition to letrozole was compared against letrozole plus placebo . The clinical response rate by palpation was higher in the everolimus arm (68 versus 59%, P = 0.06, prespecified cutoff for significance <0.1), suggesting everolimus increased letrozole efficacy in the neoadjuvant setting . Interestingly, Ki67 expression was evaluated at baseline and after 15 days of treatment, in 91 tumors for the everolimus arm and 82 tumors for the placebo arm, and the evaluation was based on the reduction in Ki67 expression to natural logarithm of percentage positive Ki67 of less than 1 at day 15. The results show a greater antiproliferative response for the everolimus treated patients (57% of patients with everolimus responded versus 25% of patients with placebo, P < 0.01). TAMRAD was a phase II randomized trial of tamoxifen plus everolimus versus tamoxifen alone in patients with HR+, HER2- advanced breast cancer and previous exposure to an aromatase inhibitor (AI) . The primary end point was the clinical benefit rate of tamoxifen plus everolimus and was estimated as 61% (compared to 42% with tamoxifen alone). Otherwise, time to progression appeared to be more prolonged with the combination compared to tamoxifen alone (8.6 months versus 4.5 months, hazard ratio 0.54, 95% CI 0.36 to 0.). At the last update of overall survival in September 2011, only 16 patients were dead in the combination group versus 31 with tamoxifen alone. Median overall survival was not available for the combination group while it was 32.9 months for tamoxifen alone. The phase III trial BOLERO-2 enrolled 724 patients with HR + advanced breast cancer who experienced a recurrence during or within 12 months after the end of adjuvant non-steroidal aromatase inhibitor (nsAI) treatment or progression during or within 1 month after the end of nsAI treatment for advanced disease . Patients were randomized to receive everolimus combined with exemestane versus exemestane plus placebo. At the time of the pre-planned interim analysis, the median progression-free survival (PFS) was significantly better for the everolimus plus exemestane arm compared to the control arm, for both local investigator and central assessment analyses (6.9 months versus 2.8 months, hazard ratio 0.43, 95% CI 0.35 to 0.54, P < 0.001; 10.6 versus 4.1 months, hazard ratio 0.36, 95% CI 0.27 to 0.47, P < 0.001) . At a median follow-up of 18 months, the addition of everolimus to exemestane was confirmed to significantly improve patient outcome over exemestane alone (median PFS 7.8 versus 3.2 months, hazard ratio 0.45, 95% CI 0.38 to 0.54, P < 0.0001) . Everolimus has since received approval from the Food and Drug Administration and the European Medicines Agency in combination with exemestane for HR+/HER2- advanced breast cancer patients after failure of a nsAI [13, 14]. However, many questions remain to be addressed. For example, the role of everolimus in premenopausal women and endocrine sensitive patients has yet to be established. Other schedules, such as everolimus alone or in combination with chemotherapy, need to be evaluated and compared to the approved treatments. Ongoing trials are beginning to address some of these issues. BOLERO-6 is a three-arm phase II randomized trial comparing everolimus plus exemestane, exemestane alone and capecitabine for patients with HR+/HER2- advanced breast cancer refractory to nsAI (ClinicalTrials.gov number NCT01783444), while BOLERO-4 (single-arm, phase II) is evaluating the combination of everolimus and letrozole as a first-line treatment for patients with ER + advanced breast cancer (endocrine treatment for early breast cancer is allowed, if completed 1 year before enrollment) (ClinicalTrials.gov number NCT01698918). A broad clinical development program for everolimus in early breast cancer is being pursued, with two investigator-initiated studies evaluating everolimus in the adjuvant setting in patients with high-risk disease. An ongoing American study is planning to enroll up to 3,400 premenopausal and postmenopausal women with HR+/HER2- breast cancer who have received prior standard neoadjuvant or adjuvant chemotherapy. Patients will be randomized to receive everolimus 10 mg/day or placebo for the first year of 5 years of adjuvant endocrine therapy (ClinicalTrials.gov number NCT01674140). A phase III French-UK study will evaluate the addition of everolimus to adjuvant endocrine treatment for patients with HR+/HER2- breast cancer who remain disease-free following 2 to 3 years of adjuvant endocrine therapy (ClinicalTrials.gov number NCT01805271). These studies have a different design and will hopefully provide clarifications on two different points. The American one will test the efficacy of adjuvant everolimus upfront for all subjects; therefore, the biologic background refers mainly to baseline mTOR activation. In contrast, the European study plans the introduction of everolimus after 2 to 3 years of adjuvant endocrine therapy, and will mainly focus on the hypothesis of induced mTOR activation occurring during anti-endocrine treatment. The results are expected to shed light on the underlying disease mechanisms. Despite these interesting findings, one phase III randomized trial appeared to be negative: the HORIZON trial enrolled 1,112 AI naïve patients to evaluate the efficacy and safety of a letrozole and temsirolimus combination daily versus letrozole and placebo in patients with advanced HR + breast cancer. Unfortunately, HORIZON was stopped for futility as the letrozole-temsirolimus combination did not lead to an improvement in PFS, which was the primary end point, and more grade 3 or 4 adverse events (AEs) were noticed (median PFS of 9 months, hazard ratio 0.90, 95% CI 0.76 to 1.07, P = 0.25). This trial was especially conducted with AI naïve patients and only 40% received adjuvant endocrine therapy, testing the primary resistance and possibly explaining the negative results compared to the BOLERO-2 trial . HER2 overexpression/amplification leads to an aggressive breast cancer phenotype and poor prognosis . The introduction of the recombinant humanized anti-HER2 monoclonal antibody trastuzumab in the management of this breast cancer subtype has dramatically improved patient outcome . However, many patients develop resistance to this therapy. PTEN loss or PI3K mutation have been shown to induce mTOR activation and mediate trastuzumab resistance . Other preclinical studies have shown that rapalogs overcome resistance to trastuzumab , suggesting that mTOR inhibitors could potentially delay or reverse trastuzumab resistance. Early-phase trials (phase Ib-II) have evaluated the efficacy of the addition of everolimus to trastuzumab plus paclitaxel or vinorelbine for patients with HER2+ advanced breast cancer who progressed after trastuzumab. These studies reported overall response rates in the range of 19 to 44%, indicating that mTOR inhibitors can overcome resistance to trastuzumab [20–22]. BOLERO-1 and BOLERO-3 are randomized phase III trials addressing HER2+ advanced breast cancer. BOLERO-3 has tested the hypothesis that addition of everolimus could overcome an acquired resistance to anti-HER2 therapy . Patients (n = 572) have been receiving vinorelbine, trastuzumab with everolimus (5 mg/day) or placebo, and initial results indicate that everolimus is able to improve PFS in trastuzumab-resistant patients (hazard ratio 0.78, 0.95% CI 0.65 to 0.95). Interestingly, PFS subgroup analyses determined more benefit for patients with prior adjuvant or neoadjuvant trastuzumab treatment and who were HR- (hazard ratio 0.65, 95% CI 0.48 to 0.87). BOLERO-1 is an ongoing phase III randomized trial involving patients with HER2+ advanced breast cancer who have not received trastuzumab in the metastatic setting, thus testing the potential for everolimus to overcome baseline trastuzumab resistance. Patients will be randomized to receive paclitaxel plus trastuzumab and the same combination plus everolimus (10 mg/day). The primary end point will be PFS (ClinicalTrials.gov number NCT00876395). Considering the research efforts currently being applied to the development of HER2 drugs, it will be important to identify patients that are highly sensitive to everolimus. Indeed, the results of BOLERO-3 should have particular relevance for this issue. The rationale for developing rapalogs for treatment of triple-negative breast cancer (TNBC) is based on the recent detection of a high frequency of PTEN loss, which is known to correlate with AKT activation, in array comparative genomic hybridization studies [24, 25]. A recent gene expression analysis of TNBC identified at least six tumor molecular subtypes, including a mesenchymal-like subset that was highly sensitive to PI3K/mTOR inhibitors in vitro and in vivo. Additionally, everolimus has been shown to sensitize basal-like breast cancer to DNA damaging agents, including cisplatinum [27, 28]. These preclinical findings have led to clinical evaluation of everolimus in TNBC. In a phase II neoadjuvant study including 50 TNBC patients, everolimus has been tested in addition to 12 weekly administrations of paclitaxel followed by fluorouracil, epirubicin and cyclophosphamide every 3 weeks for four cycles . There was a higher clinical response rate in the everolimus treatment compared to chemotherapy alone (48% versus 30%), but this did not reach statistical significance (P = 0.075). Another phase II randomized study comparing neoadjuvant cisplatin and paclitaxel with or without everolimus (Clinicaltrials.gov number NCT00930930) is ongoing. Critical points for future research will be to define, if possible, a subgroup of TNBC patients most likely to benefit from the addition of everolimus to chemotherapy and to define the potential predictive role of PTEN loss. Preclinical studies have suggested that rapalogs could synergize with taxanes  and this has been addressed in a recent neoadjuvant phase III study . Patients with HER2- breast cancer (n = 403) were enrolled. Patients showing no response after four cycles of preoperative epirubicin and cyclophosphamide (with or without bevacizumab) were randomized to receive paclitaxel or paclitaxel plus everolimus (starting at 2.5 mg every other day and escalating to 5 mg per day). The pathologic complete response was 3.6% in the paclitaxel group, compared with 5.6% in the paclitaxel plus everolimus group (P = 0.476). Moreover, the clinical response rate was 52% and 62% in the paclitaxel alone and everolimus groups, respectively. Although there is currently no evidence to suggest everolimus may be able to overcome chemoresistance in these patients, the appropriateness of pathologic complete response as the optimal end point for the efficacy of new targeted agents is questionable. Furthermore, everolimus and chemotherapy dose intensities may require optimization for best results. Other studies, such as a randomized phase II trial evaluating a combination of paclitaxel and bevacizumab with or without everolimus (10 mg/day) for patients with HER2- metastatic breast cancer (Clinicaltrials.gov number NCT00915603) are ongoing. In the everolimus trials, the most common AEs are fatigue, stomatitis, anorexia, diarrhea, metabolic disorders with hyperglycemia, noninfectious pneumonitis and hematologic disorders. These AEs were noticed in the TAMRAD study, mostly grade 1 to 2 in severity , as well as in the BOLERO-2 trial, in which 23% of patients in the combination treatment had serious AEs versus 12% in the exemestane group . In a phase 1 study, stomatitis was the most common AE, occurring in 27 of the 33 patients enrolled at any grade, 7 of which were grade 3 . They also observed one interstitial pneumonitis. Everolimus is usually relatively tolerated but sometimes needs to be adapted with dose reduction and a perfect knowledge of AEs is required for treating patients. Similar AEs were observed in the temsirolimus trial, with some cases of headache and fever; most grade 3 AEs were hyperglycemia, hyperlipemia, dyspnea and asthenia . Three principal questions remain to be addressed in biomarker research into mTOR inhibitors. Firstly, it will be important to define whether mTOR ‘activated’ tumors are more sensitive to rapalogs. To achieve this, it will be necessary to identify biomarkers of mTOR pathway activation and evaluate the sensitivity of the mTOR activated breast cancer population to mTOR inhibition. 4EBP1 is phosphorylated by mTOR into p4EBP1, which is a downstream effector of the mTOR pathway (Figure 3). Biomarker studies conducted on 55 samples from the TAMRAD trial suggested that everolimus is more effective for patients with high levels of p4EBP1, suggesting that baseline mTOR activation is associated with sensitivity to everolimus . Everolimus sensitivity. Schematic representation of the sensitivity to everolimus. 4E-BP1, eIF4E binding protein 1; AKT, protein kinase B; AMPK, adenosine monophosphate-activated protein kinase; IGF1R, insulin growth factor 1-receptor; LKB1, liver kinase B1; mTOR, mammalian target of rapamycine; PI3K, phosphatidylinositol-3-kinase. Secondly, it will be important to identify patients that are hypersensitive to mTOR inhibitors. Analysis of such a subgroup could lead to the identification of genetic drivers of mTOR-activation. GOLPH3 amplifications and PTEN, STK11 and TSC1 mutations have all been described as outlier responders to everolimus [33–36]. Sensitive patients can then be further classified on the basis of the pathway responsible for everolimus efficacy (for example, the PI3K-dependent ‘classic’ pathway or the LKB1/AMPK metabolic pathway). Preclinical findings suggest that PI3K mutation is a predictor of mTOR inhibition efficacy ; however, recent next-generation sequencing results of 309 samples from the BOLERO-2 trial failed to confirm this. Indeed, neither PIK3CA mutation nor PI3K pathway alteration by mutations in other pathway members were predictive of everolimus benefit . Interestingly, results from the TAMRAD study suggest that mTOR activation by the LKB1/AMPK pathway predicts everolimus efficacy . Finally, research efforts should focus on patients with primary or acquired resistance to mTOR inhibition. Some markers of intrinsic resistance have already been proposed in preclinical models, such as KRAS mutations or a high 4EBP1/elF4E expression ratio [39, 40]. Next-generation sequencing from the BOLERO-2 trial has demonstrated that patients with a minimal number of genetic alterations derived the greatest benefit from everolimus, suggesting that concomitant mutations in other oncogenic pathways might mediate resistance or attenuate everolimus efficacy . Interestingly, this study found that FGFR1 amplification was associated with reduced sensitivity to mTOR inhibitors. Regarding secondary resistance, it has been found that activating feedback loops involving insulin growth factor 1-receptor (IGF-1R)/PI3K can occur during mTOR inhibition, resulting in AKT and mitogen-activated protein kinase activation [41, 42] (Figure 4). These observations suggest that multiple drug combinations may be required to overcome resistance. A combination of temsirolimus and cituxumumab, a fully human immunoglobulin G1 monoclonal antibody directed against IGF-1R, was evaluated in a phase I trial . Forty-two advanced breast cancer patients were enrolled, including nine breast cancer patients. Four of the nine presented a stable disease for 1 to 5 months. Other trials testing rapalogs plus IGF-1R inhibitors are ongoing. Through definition of the various feedback loops and validation of methods used to identify the responsible mechanisms in patients, it may be possible to design personalized approaches to restore mTOR inhibition sensitivity. Another strategy may be to use ATP competitive mTORC1 and mTORC2 inhibitors, which may result in both stronger mTOR inhibition (as defined by higher bioactivity on p4EBP1) and in the blockade of the potential feedback loop that involves mTORC2 . Interestingly, a phase 1 trial with a dual mTORC1/mTORC2 inhibitor (INK128) enrolled 52 patients with advanced cancers treated according to three schedules. The authors recently presented their findings: toxicities were dependent on the protocol and were acceptable and the primary results on anti-tumor activity are interesting . Moreover, a phase 1 trial of oral PI3K/mTOR inhibitor P7170 in patients with advanced refractory solid tumors is ongoing (ClinicalTrials.gov number NCT01762410) and this combination is going to be tested in patients with advanced breast cancer with exemestane in a phase 2 trial (ClinicalTrials.gov number NCT01658176). These results will be highly anticipated. Feedback loops after rapalog exposure. After rapamycin, various feedback loops are triggered by ribosomal protein S6 kinase beta-1 (S6K1). The S6K1/insulin-like growth factor 1 receptor (IGF-1R)/phosphatidylinositol-3-kinase (PI3K) loop results in protein kinase B (AKT) activation, while the second loop is S6K1/IGF-IR/PI3K and mitogen-activated protein kinase (MAPK) pathway-dependent. Both loops are implicated in secondary resistance to mammalian target of rapamycin (mTOR) inhibitors. mTORC, mTOR complex; P, phosphorylated; Ras, rat sarcoma virus; TK, tyrosine kinase. In this review we have highlighted the importance of integrating biologic and clinical data for the clinical development of mTOR inhibitors. Indeed, a molecular stratification of breast cancer patients based on mTOR-related factors may be key for future research in the field. Overall, various ongoing phase III clinical trials are testing the efficacy of everolimus according to the hypothesized timing of mTOR activation, for both HR + and HER2+ breast cancer. This reflects the proposed classification into ‘baseline’ and ‘during treatment’ mTOR activation. Furthermore, biomarker studies in the metastatic setting and new tools for molecular diagnosis (such as phosphoprotein quantification and polysome profiling) should be conducted and developed in the proposed patients groups. These will help answer some of the major unanswered questions. In addition, studies in the post-everolimus setting will be required for the second wave of rapalogs. This article is part of a series on “Recent advances in breast cancer treatment”, edited by Jenny Chang. Other articles in this series can be found at http://breast-cancer-research.com/series/treatment. FA served as an advisor or consultant for Novartis Pharmaceuticals Corporation, served as a speaker or a member of a speakers bureau for AstraZeneca Pharmaceuticals LP and Novartis Pharmaceuticals Corporation and received grants for clinical research from Novartis Pharmaceuticals Corporation.